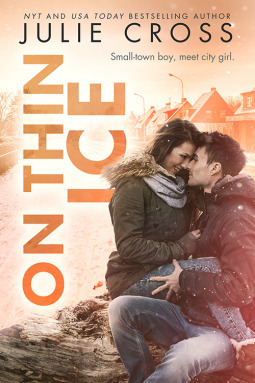 On Thin Ice will be available February 26, 2019. I have liked the other books in the Juniper Falls series, but I really loved On Thin Ice. It completely surpassed my expectations and I enjoyed it so much that I already want to re-read it. I found both Jake and Brooke really likable characters. They both have had rough things happen in their lives and I felt like their reactions made sense for their age and situations. I also really loved them together. Their relationship didn’t have the best start, but I loved how it developed. I also really enjoyed seeing characters from the previous books like Tate, Claire, Fletcher, and Stellers. I thought the hockey hazing storyline was well done. Over the course of the series we’ve seen how toxic the environment can be and how hockey players are given a lot of slack in the town, but it all really comes to a head here. I was glad to see the behavior was finally addressed and that it was the players themselves that brought it forward. It was a refreshing take on such a serious topic. I do wish that the issues with Brooke’s family were given a little more attention, though. Topics like self-harm and a suicide attempt are brought up and pretty quickly dismissed. Overall, I just really loved On Thin Ice. I enjoyed the characters, the friendships, the romance, and the addictive writing. I really never wanted to put this one down. I recommend this one to fans of YA Contemporaries. I really did love it! I was in just the right mood for it. I hope there’s more books in the series! You know what book would have fit right in this series for me, but was from another author? Cold Day in the Sun by Sara Biren. It had high school hockey, great character growth and tough topics. I think you would like that book. I actually added that to my TBR after I saw your review on it. I’m more excited for it now, though, since it sounds similar to this series! Thanks! It’s a cute series, though this installment was definitely my favorite.